On March 1, 2018, 4 people from Karlsruhe Institute of Applied Sciences (HsKA) in Germany visited UoA and MoU signing ceremony was held. The visiters from HsKA were Dr. Dieter Hoepfel, Vice President of HsKA, Dr. Joachim Lembach, Director of International Office, Dr. Wolfgang Ziegler, Professor of Information Content Management and Dr. Claas Christian Wuttke, Professor of Production and Logistics. 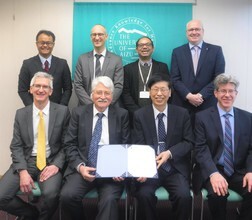 The next day of the ceremony, conference were held with HsKA visitors, and also Regent Dr. Miyazaki, Prof. Kawaguchi, Director of OSIP and some professors of Center for Language Research. 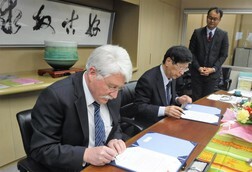 They discussed the future prospects and plans of academic and research exchange. HsKA also wrote the article about the visit on their official website.